Create a Michigan Automobile Insurance Fraud Authority which would provide resources to law enforcement to aggressively pursue incidents of suspected insurance fraud (suspicious claims amount to $400 million annually). Limit attendant care provided by family members to $15/hour (which amounts to over $131,000/year), adjusted for inflation. Family members who are Licensed Medical Professionals are not subject to the limit. A medical review of the patient’s needs and care may be requested if additional care or resources are needed. Transition from the existing MCCA (would become the Michigan Legacy Claims Association or MCLA) reimbursement/reinsurance mechanism to a new Michigan Catastrophic Claims Corporation (MCCC) excess insurance mechanism. An auto insurance carrier's liability would be capped at $545,000, beyond which the claim and liability would transfer to the new MCCC. Medical providers would be reimbursed at 150% of Medicare rates which, according to committee comments is anywhere from 20-30% higher than most commercial reimbursement rates. Require at least a $100 per vehicle rate reduction for two years. Governor SnyderLANSING, Mich. - Gov. Rick Snyder joined State Sen. Joe Hune, State Rep. Pete Lund and business leaders to announce a plan for no-fault auto insurance reform that will lower the cost of insurance for Michigan drivers, continue to provide the best catastrophic injury protection in the nation and ensure a fair and sustainable system into the future. 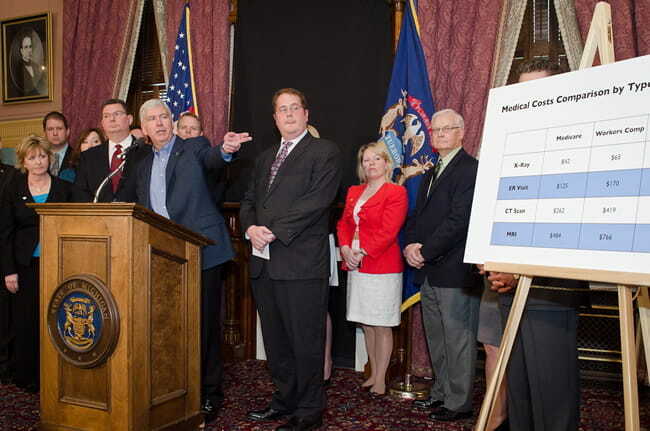 "Michiganders have seen their auto insurance rates rise faster than any other state in the country," said Gov. Snyder. "It has been 40 years since the no-fault system has been implemented and it's long overdue for review. These changes will create a policy that continues to cover accident victims far better than any other state and will create cost controls that stem the tide of rising insurance premiums while also providing immediate relief for families."